Remote Control cars, or RC cars, are a popular toy for kids of many different ages. RC cars can provide hours of fun for kids, and they’re a fun and safe hobby that older kids will love. There are tons of different options when shopping for RC cars, and it can be overwhelming at first. Between the different scale sizes, fuel types, vehicle options, and control types, there’s a lot to think about when purchasing an RC car. To get started, check out these best-rated remote control cars for boys and girls. 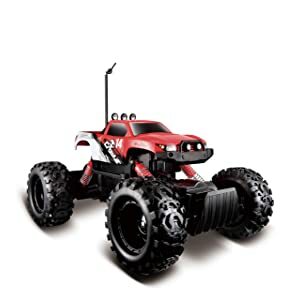 This RC car is eye-catching and sure to grab the attention of just about any little boy. The Lamborghini Veneno is a super-fast luxury sports car, and this RC model lives up to its namesake. With incredible attention to detail, this RC car looks exactly like the real thing. The sleek silver paint and LED headlights make this Lamborghini Veneno model stand out among other RC cars. In true Lamborghini fashion, the doors open and close by swinging upwards. The remote has a special button that opens the doors, which boys are sure to enjoy showing off to their friends. The car comes with a joystick controller, which should be fairly simple for most kids to use. It runs on three AA batteries and comes with two rechargeable NiCad battery packs, so you’re not constantly buying new disposable batteries. It has excellent battery life as well and can run for hours without needing to recharge. The joystick has three buttons on it—a stop button, the door button, and a demo button. The demo button makes the car do a simple demonstration, moving around backwards and forwards and turning a few times. It’s not the fastest RC car on the market, but it gets enough speed to keep most kids happy. The biggest drawback of this RC car is that it’s designed more for looks than function. While it is extremely sleek and detailed, the car lacks bumpers and sits low to the ground. 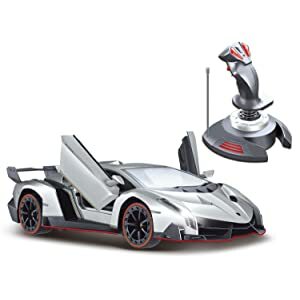 This makes it look more like the real Lamborghini Veneno, but means that it can have a hard time with obstacles and get a bit scratched up if you’re playing with it outside. Overall, this car will still delight most boys and is an excellent choice. The Maisto RC Rock Crawler is, from the very first glance, essentially the opposite of the Holy Stone Lamborghini Veneno. Its tough and rugged appearance is sure to capture the attention of any boy who loves monster trucks. The tires are big, with lots of tread, and it looks like a monster truck you’d see tearing through the mud at a rally. This RC car is designed for off-road action. The Rock Crawler has an amazing suspension, and it can easily climb over rocks, grass, sidewalks, etc. It has two motors to give it extra power, which makes the car pretty loud. This may be a plus for some young boys who want to hear the motor purr, but could be annoying for parents after a while. For the budding RC enthusiast, the Maisto Rock Crawler is pretty much the ideal RC car. It looks and performs like a high-end RC car, but comes at a much cheaper price. You’ll be able to drive this outside or inside with no problems, and boys will have tons of fun maneuvering this car around the neighborhood or the house. 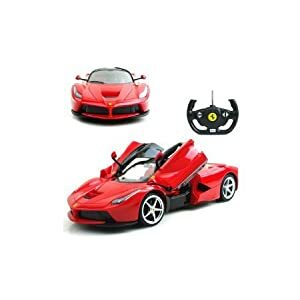 The Rastar Ferrari LaFerrari RC car is the best of both worlds. It looks just like the real LaFerrari, with incredible detail and realism. However, this RC car isn’t just for show. It’s fast, with speeds around 10 mph on smooth surfaces. This RC car also has those little details that make it that much cooler. The doors really open, swinging upwards just like on a real LaFerrari. The paint is nice and glossy on the body, and the rims are shiny and detailed. When the car moves forward, the LED headlights even turn on. While it’s not designed for outdoor use, the Rastar Ferrari LaFerrari can be used outside on pavement or other smooth surfaces. It won’t climb over rocks or push through grassy fields, however. Another great feature of this RC car is the controller itself. Designed to look like a real Ferrari steering wheel, the controls are fun and easy to use. Kids will enjoy these controls, as it feels more like driving a real car than other RC models with joystick controls. 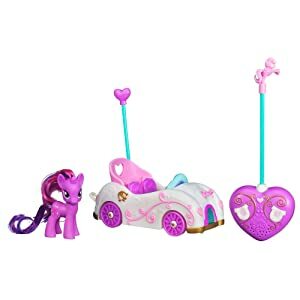 This My Little Pony Twilight Sparkle RC car is fun for younger girls. The car is white with pink and purple designs and a little heart atop the antenna, making it immediately attractive for girls. The remote is stylish, too, with a heart-shaped pink body and a tiny pink pony figurine on top of the antenna. Plus, this RC car comes with a Twilight Sparkle pony figurine sure to delight fans of My Little Pony. The car is simple to operate, making it ideal for younger girls, and it’s recommended for ages 3 and up. The remote has a button for the car to go forward and turn buttons to make the car turn. Young girls should have no problem learning to control the car. This RC car works best indoors on smooth surfaces. While it can drive over carpet, the car struggles a bit. It glides easily over hardwood or linoleum floors. The car doesn’t go incredibly fast, but this shouldn’t be a problem, as the car is clearly intended for younger girls. Perhaps the most exciting feature of this particular RC car for young girls is the ability to put the Twilight Sparkle figurine in the car. Holes in the figurine’s feet allow it to attach to the car. Additional figurines can be purchased to ride in the car, too. This RC car is geared towards preschool-aged girls. Its light pink body and pink steering wheel control are fun and attractive. 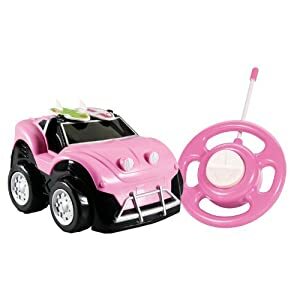 This pink RC car has a soft rubbery body, so it absorbs impact easily, perfect for young kids who might drive it into a wall. The controls are simple, too, with one button to move forward and another to spin backwards. Kids should easily be able to control the car, and the remote requires only 3 AA batteries. The battery life is fairly long, providing hours of play. While the Go Go Baja Buggy isn’t fast, it rides smoothly indoors on hardwood floors. It manages well on carpet, too, but is not recommended for outdoor use. The Jada Girlmazing Big Foot Jeep is an ideal RC car for older girls. 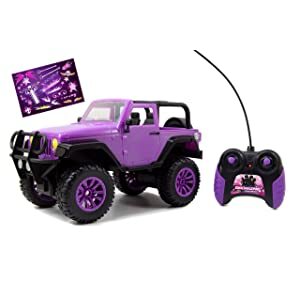 This sparkly purple RC car looks just like a real Jeep and comes with a remote with two stick controls. The car also comes with decal stickers to personalize and decorate the car to your liking. The car doesn’t go too fast, but can get up to decent speeds on hardwood floors. It struggles to go over bumpy surfaces, such as outdoors, but has no problem driving over carpet. Though not made for outdoor use, the car performs fairly well on some outdoor surfaces. Plus, this RC car is the perfect size to hold Barbie or other popular dolls in the seats. Girls will love playing with this RC car, and thanks to its long battery life, you can go days without changing batteries. RC cars are a great toy for a variety of reasons. First, they’re a great way to get kids outdoors and active. Kids will love taking their RC car around the neighborhood or to local parks. RC cars that are designed for off-roading can provide even more adventure and encourage kids to really explore nature and the world around them. RC cars also teach kids to be responsible and care for their own belongings. An RC car sometimes requires maintenance and care. This will prepare kids to own a real car someday and teach them the value of caring for their possessions. Kids may even want to modify or upgrade their RC car, which is a great opportunity for them to learn a new skill and gain some mechanical knowledge. Plus, this kind of hands-on activity is more engaging than playing a video game, and it promotes attention to detail and teaches kids to explore and tinker with things. Additionally, for younger children, an RC car helps with hand-eye coordination and fine motor skills. Young children need to work on these critical skills in order to develop and grow, and an RC car is the perfect way to do this. As they learn to use the controls and drive their RC car, kids will get better at it, thus improving their hand-eye coordination, a skill that can be applied to many other areas, such as sports. Finally, RC cars are fun for the whole family. This is a toy that kids will actually enjoy playing with, and kids of all ages can enjoy RC cars. Older kids will love faster cars and navigating around obstacles, while younger kids will just love controlling their own RC car. Parents can even help out, showing their child how to drive the car or how to perform basic maintenance.RC car racing is an activity the whole family can really get involved in.